Here is the chapter outline for my novel. I really wrestled with this, trying to figure out if I had enough of a story to make it ten chapters and how to resolve it. I’m not sure if I’m completely satisfied yet, but I think I’m finally starting to understand where I’m going with this. And if you have any suggestions as to things to add or parts to make it better or different chapter titles or anything else you can think of, please, comment away! And also, if you are interested in following my novel more in-depth, please visit my novel blog where I’ll be posting probably all my actual chapters. As his daughter twelve-year-old daughter Abihail watches, Jairus carefully finishes spinning a vase for her on his potter’s wheel. After completing this and closing up his shop just before sundown, Jairus and Abihail return to the adjoining house for Sabbath dinner and discussion with Keturah. The Sabbath passes peacefully, and Jairus takes Abihail with him for to drop off a pot at the shop of his brother-in-law, Mordecai, in exchange for a pair of sandals. The two get in an argument over their two different styles of seeking truth: Jairus, through the Law, and Mordecai, through action. In the midst of this heated discussion, two Roman soldiers come into Mordecai’s workshop and demand to do business with him. Mordecai vehemently insults these symbols of Caesar’s rule, and his brashness results in a fray. Jairus tries vainly to keep the peace while Mordecai is arrested, and Abihail accidentally cuts her leg on an awl trying to get out of the way. In shock from this drastic turn of events, Jairus takes Abihail home to have her wound tended, consults with Keturah as the best course of action to free Mordecai, and struggles internally with his circumstances. The conflict he has gone out of his way to avoid is now his. The next afternoon, Jairus goes dutifully to the barracks of the soldiers to see the centurion about Mordecai. A God-fearing man, the centurion works with Jairus to arrange Mordecai’s release. He also tells the potter how Jesus healed his servant, planting a seed in Jairus’ mind. The centurion orders Mordecai to be brought out. In the stillness, Jairus returns home to his family and realizes it is only the calm before the storm; Abihail’s wound is not healing. A few days reveal that, despite all her parents’ attentions to her, her cut is severely infected and a fever sets in. On examining her, the physician pronounces her case hopeless with only days to live. 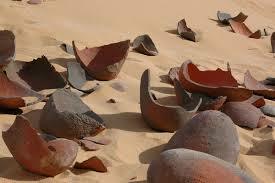 On hearing this, Jairus drops the vase he made so carefully for Abihail, and it shatters to pieces at his feet. Jairus’ desperation is mounting; the meaning of Abihail’s name, ‘a father is strength’, seems to mock him everywhere he turns. The only possibility he can think of is the rumors he has heard that Jesus of Nazareth can work miraculous healings. Overcoming all his scruples about his public reputation, he goes to find this traveling Teacher. As it turns out, Jesus has not yet returned from across the lake, and Jairus waits impatiently for his arrival. Finally, Jesus and his disciples pull up on the lakeshore.